1-15) Optics Lett., 31 (3) 320-322 (2006). 図2 The observed χdependence of electroabsorption of pNA in CH3CN/CCl4 mixed solvent. 図3 The structure of the 1:1 form (a) and that of 1:2 form (b). 1-9) J. Physical Chem. A, 110 (13) 3738-3743 (2006). Raman spectra indicative of unusual water structure in crystals formed from a room-temperature ionic liquid. Hiroko Miki, Satoshi Hayashi, Hiroshige Kikura and Hiro-o Hamaguchi, J. Raman Spectrosc., 37, 1242-1243 (2006). Vibrational imaging of a J-aggregate microcrystal using ultrabroadband multiplex coherent anti-Stokes Raman scattering microspectroscopy. Hideaki Kano and Hiro-o Hamaguchi, Vibrational Spectrosc., 42 (1) 135-139 (2006). Magnetic manipulation of materials in a magnetic ionic liquid. Masanari Okuno, Satoshi Hayashi and Hiro-o Hamaguchi, Appl. Phys. Lett., 89, 132506 (2006). Evidence for mesoscopic local structures in ionic liquids: CARS signel spatial distribution of C(n)mim[PF6] (n=4,6,8). Shinsuke Shigeto and Hiro-o Hamaguchi, Chem. Phys. Lett., 427, 329-332 (2006). Ion association dynamics in aqueous solutions of sulfate salts as studied by Raman band shape analysis. DaisukeWatanabe and Hiro-o Hamaguchi, J. Chem. Phys., 124, 247102 (2006). Heat capacity and glass transition of an ionic liquid 1-butyl-3-methylimidazolium chloride. Osamu Yamamuro, Y.Minamimoto, Y. Inamura, Satoshi Hayashi and Hiro-o Hamaguchi, Chem. Phys. Lett., 423, 371-375 (2006). In-vivo multi-nonlinear optical imaging of a living cell using a supercontinuum light source generated from a photonic crystal fiber. Hideaki Kano and Hiro-o Hamaguchi, Optics Express 14, 2798-2804 (2006). Structure and dipole moments of the two distinct solvated forms of p-nitroaniline in acetonitrile/CCl4 as studied by infrared electroabsorption spectroscopy. Shinsuke Shigeto, Hirotsugu Hiramatsu and Hiro-o Hamaguchi, J. Physical Chem. A, 110 (13) 3738-3743 (2006). Vibrational Imaging of a Single Pollen Grain by Ultrabroadband Multiplex Coherent Anti-Stokes Raman Scattering Microspectroscopy. Hideaki Kano and Hiro-o Hamaguchi, Chem. Lett., 35 (10) 1124-1125 (2006). Molecular near-field effect and intensity enhancement of solvent modes in resonance hyper-Raman sattering. 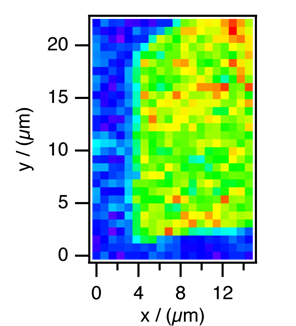 Rintaro Shimada, Hideaki Kano and Hiro-o Hamaguchi, J. Raman Spectrosc., 37, 469-471 (2006). Effect of water on the molecular structure and arrangement of nitrile-functionalized ionic liquids. Satyen Saha and Hiro-o Hamaguchi, J. Phys. Chem. B, 110 (6) 2777-2781 (2006). Dispersion-compensated supercontinuum generation for ultrabroadband multiplex coherent anti-Stokes Raman scattering spectroscopy. Hideaki Kano and Hiro-o Hamaguchi, J. Raman Spectrosc., 37, 411-415 (2006). Three-Dimensional Vibrational Imaging of a Microcrystalline J-Aggregate Using Supercontinuum-Based Ultra-Broadband Multiplex Coherent Anti-Stokes Raman Scattering Microscopy. Hideaki Kano and Hiro-o Hamaguchi, J. Phys. Chem. B, 110 3120-3126 (2006). Hyper-Raman microspectroscopy: a new approach to completing vibrational spectral and imaging information under a microscope. Rintaro Shimada, Hideaki Kano and Hiro-o Hamaguchi, Optics Lett., 31 (3) 320-322 (2006). A new nonlinear Raman probe for local structures in liquids and solutions. Shinsuke Shigeto and Hiro-o Hamaguchi, Chem. Phys. Lett., 417, 149-153 (2006). A new class of magnetic fluids: bmim[FeCl4] and nbmim[FeCl4] ionic liquids. Satoshi Hayashi, Satyen Saha and Hiro-o Hamaguchi, IEEE Transactions on Magnetics, 42, 12-14 (2006). イオン液体のナノ構造と特異性． 奥野将成, 濵口宏夫 「ナノ学会会報」 5 (1) 9-12 (2006). 磁性イオン液体：磁石にくっつく不思議な液体． 奥野将成, 濵口宏夫 「サイエンスネット」 27, 14-15 (2006). ラマン分光で見る分子レベルでの生命活性 -細胞物理化学事始め-. 内藤康彰, 黄郁珊, 濵口宏夫 Biophilia 2 (3) 14 (2006). 単一酵母生細胞のIn Vivoラマン分光/イメージングと生命のラマン分光指標. 黄郁珊, 内藤康彰, 加納英明, 濵口宏夫 「化学と生物」 44, 8, 551-555 (2006). 非線形ラマン顕微分光法による振動分光イメージング—分子性結晶から単一生細胞まで—. 加納英明, 島田林太郎, 濵口宏夫 「応用物理」 75, 6, 682-688 (2006). 酵母単一生細胞の時空間分解ラマン分光. 黄郁珊, 濵口宏夫 「蛋白質 核酸 酵素」 51, 3, 262-267 (2006).